Welcome to the fourth part of the series about what is new in the upcoming EJBCA 6. For the third part in the series, read Part 3: Internal Key Bindings. In part 4 we will dig into the concepts of EJBCA Enterprise and Community. The separation was started with the Common Criteria certification of EJBCA 5, and is now completely harmonized with EJBCA 6. EJBCA Enterprise brings additional value to organizations that subscribe to support services, this blog post will tell you what, and why. The freshest, most up to date, description of EJBCA Enterprise will be available at PrimeKey. Enterprise editions is a common way for open source projects and companies to offer additional value to organizations that subscribe to support services, and hence indirectly pay the bills for the developers of the software. The requirements on professional enterprise software are very high nowadays and the users demand high quality, lots of features, software certifications etc. There is simply need for a lot of full time staff to develop and support an enterprise scale software today. Income is needed to pay salaries. The Community is one of the founding pillars of Open Source software, the community has made us what we are. The community needs a comfortable way to use, interact and to contribute to the future of the project. To keep up that pace of development, and support, there is of course a need for constant business. What we need, as a company, is to provide added value so that you find that you get great benefit from the money. This is where the Enterprise edition comes in. There are many very appreciated organizations in the world, that subscribes to support. Thank you, you know who you are! There are many appreciated community members, thank you as well! PrimeKey, with EJBCA, started out with an Enterprise edition as of EJBCA 5, where PrimeKey, together with partners, made a huge investment to make the software Common Criteria certified. With EJBCA 6 we want to finalize and harmonize the concept and versions. All this with Open Source! To focus the enterprise additions on the main target markets where we compete with proprietary software and can provide support services to organization that are prepared to pay for these services. Providing the best PKI services from the most experienced staff, with add-ons that makes their PKI the most efficient and cost-effective PKI on the market. Enabling the Open Source Community with the best PKI product on the market with full features, allowing everyone to contribute directly to the latest version of the project in a simple way, with full access to the source code. Professional support with different SLAs and private support portal access. Bug, security and hot fixes. Additional integration guides and supported integration with 3rd part products (for example token management). Secure audit logging (log signing). High Availability setups with redundant clusters and disaster recovery. EAC ePassport PKI, with BAC, EAC, SPOC, PKD etc. Database CLI for migration between databases, verification of integrity protection etc. Tools for speeding up deployments across environments. Validation tool for conformance checking of certificates and OCSP responders. Upgrade assistance, also from very old versions of EJBCA Community to the latest EJBCA Enterprise. Last but not least, soon to be available in a plug and play PKI Appliance. If you are using EJBCA Community, and are interested in EJBCA Enterprise, or if you just want to know more. Don't hesitate to contact me at tomas@primekey.se. Migrations from Community to Enterprise is of course trouble free and we can help you every step of the way. If you are interested in getting to know the different subscription options, contact sales@primekey.se, we are flexible. Check in with PrimeKey, or follow us on Twitter, for the latest news and events. Another interesting blog post on Open Source and Enterprises is Feed the Fish, from the people behind TomEE. Joonas, Mike, Marcus, Markus, Johan, Aveen, Samuel, Lars, Konstantin, Admir, Anna, Björn, Anna, Tomas, Lars, Maikel, Marko, Raoul, Joakim, Branko, Dimitrios, Tham, Manuel, Roland, Martin. Q1. Do the improvements in EJBCA Enterprise ever find their way to Community. Answer: As I tried to state above, EJBCA Enterprise does not contain improvements of Community features. It contains specific features used for specific Enterprise use cases. These features are planned to remain Enterprise features until the concept changes (if it changes). Improvements to common functionality will be released in both Enterprise and Community. The times will only be constrained by release schedules. Enterprise is expected to have more releases than Community. Q2. Is it possible to migrate from EJBCA Enterprise back to community? If so, what is the difficulty. Answer: Yes that is possible. Naturally you will loose the Enterprise functionality such as audit log signing. The CA will continue to work, just without this feature. Q3. When someone licenses EJBCA Enterprise, if they do not wish to maintain support contract do they have to downgrade when the support contract ends. Answer: No. Naturally they will however no longer get upgrades from PrimeKey. Q4. Do improvements in Community ever find their way back into Enterprise? If yes, how long does that take. Answer: Yes, this will be included in following releases. Q5. When will EJBCA Community version 6 be released? Answer: We are currently working on the distinction between Enterprise and Community as described above. There is no fixed date, since this depends on developer resource availability. It will not be too long, don't despair. Let's face it, OpenSSL is the number one toolkit for any PKI expert when it comes to dissecting and manipulating files such as CSRs, certificates, PKCS#12 keystores, asymmetric keys etc. We use it all the time when developing EJBCA, Open Source PKI. Using openssl is not always the easiest task in the world, but there are a number of commands that I find myself using over and over again. So much that I can almost type them in my sleep. You can also add parameters to only output specific fields, like certificate serial number, public key etc. I rarely use those though, I just dump the cert and look at the whole thing. Sometimes you really want to see the nitty gritty details of a certificate or CSR, to find out what encoding is used in the DN, how the extensions look, what order fields actually are in the file etc. When generating CSRs you can add a lot of options to put in the CSR, like Subject Alternative names, certificate purposes, OCSP URLs etc. When creating CSRs to be sent to a CA this is normally not needed. The CA will populate all the fields for you, and normally ignore any additional fields that you specify (a real CA have no reason to trust arbitrary input from you). If you are generating your own self-signed certificates however, this may be of interest. Kevin McArthur has written a nice blog post how to work with OpenSSL to create certificates and CSRs. It's a bit outdated, but Kevin may update it. See also Code signing over in the EJBCA Admin Guide. I have previously written about cmpforopenssl. This is a great tool for using the CMP protocol. You can read more about cmpforopenssl and EJBCA in the EJBCA Admin Guide. You can test TLS/SSL servers using OpenSSL's s_client command. This is great for debugging TLS connections. It will show you the certificates used by the server and the accepted CA certificates sent by the server when asking for client certificate authentication. It can also be used to see the cipher suites negotiated. Another old popular blog post I wrote was about converting between JKS and P12 using simple java commands, keytool. George L wrote an interesting comment on LinkedIn. It's about MS adding CSP information when exporting a PKCS12 files, and this can cause errors when importing it into other versions of Windows. He provided a cool script that removes this information, using openssl. openssl pkcs12 -in "%~f1" -nodes -passin pass:"%pass%" | grep -v Microsoft | openssl pkcs12 -export -out "%~f1".new.pfx -passout pass:"%pass%"
The PrimeKey EJBCA team is happy to announce that EJBCA 5.0.11 has been released! This is a maintenance release – 17 issues have been resolved. The most noteworthy changes can be seen below. Support for multiple Vendor CAs in CMP for 3GPP/LTE networks. Possibility to use token label to reference PKCS#11 slots. New WS keyrecovery method for specified certificates. Development continues beyond this version and all requests from the community are scheduled for EJBCA 5.0.12 or later releases. The PrimeKey SignServer team is happy to announce that SignServer 3.4.2has been released! This is a maintenance release with in total 13 tickets resolved. The most noteworthy changes can be seen below. Development continues beyond this version and all requests from the community are scheduled for SignServer 3.4.3 or later releases. More information is available at the project web site and the complete changelog can be viewed in the issue tracker. There has recently been posted an update to the old trusted OCSP RFC (rfc2560). The updates in the new RFC6960 are quite few (a good grade for the old RFC, which is exemplary simple yet effective) and clarifies a few points that were previously seen as ambiguous, and could lead to different implementations. It also introduces a few new OCSP extensions. So how does EJBCA stand on the new RFC? Below I will go through the most important changes, that are relevant for EJBCA implementation. Changes not mentioned here are either optional and never used/requested in EJBCA, or are already implemented fully by EJBCA OCSP. This allows responders (MAY) to return "revoked" status for certificates that are unknown to the OCSP responder. 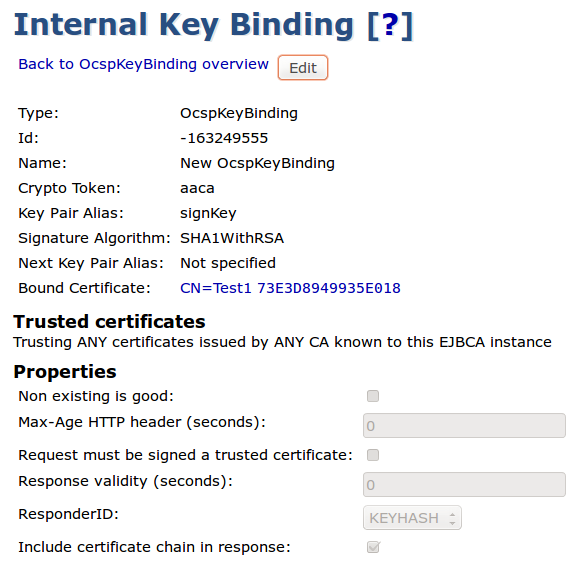 EJBCA was always designed to include all issued certificates, and to provide "unknown" response for certificates that are really unknown to the responder. So for along time EJBCA was ahead of the pack, prohibiting "ok" responses for certificates the responder did no know about. In practice an "unknown" response will be treated the same as "revoked" in most cases, i.e. the transaction denied. There was a discussion about the possibility of clients falling back to CRL processing in the case of "unknown", hence the new requirement to respond "revoked" also for unknown certificates. ECA-3132 has been created to allow responders to be configured to also return "revoked" for unknown certificates, not only "unknown". prefer the server use to sign the response as specified in [RFC6277]. This option is probably far away from being used in the wild. It can however be interesting for EJBCA to support it in the future. ECA-3133 has been created to eventually cater for this extension. This extension would also be supported as of ECA-3132 above. browsers and CAs to increase security, and improve interoperability amongs vendors. OCSP has proven to be a remarkably simple, robust, interoperable and widely used protocol, as opposed to many other protocols. Visit PrimeKey for more information about support subscriptions for EJBCA OCSP Responder. This is the first post in a series about what is new in the upcoming EJBCA 6. EJBCA 6 will be released, in both a Community and Enterprise Edition (more about that in a later post) during the autumn. EJBCA 6 is a major evolution of EJBCA with another technology upgrade (Java 7, JBoss 7), many new cool features and lots of improvements. So far more than 200 issues has been fixed, reviewed and closed and a few more remains. Why do we go up from EJBCA 4/5 to EJBCA 6? This is because there are new features that changes the way administrators interact with EJBCA. So administrative work-flows change a bit and a new major version number indicates that administrators might need updated training, and integrations should be thoroughly tested. Enough about that, and on to todays topic. Crypto Tokens and Crypto Tokens in Admin GUI. In EJBCA 6 we introduce the concept of separated, generic crypto tokens. Previously a CAs keys have been tighly tied to the CA (as a configuration object). 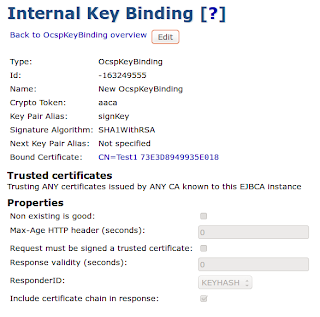 In EJBCA 6 there is a new concept of a crypto token than can be shared among multiple CAs or other services such as OCSP. A crypto token is simply a keystore and can be a software keystore in the database or a hardware keystore such as a PKCS#11 slot on a HSM. Being separated from CAs you can create, edit and delete unlimited number of crypto tokens individually, not re-configuring any CAs or services. For a crypto token you can create and configure the token (such as PKCS#11 driver, slot etc), generate and delete keys, test keys and create CSRs for individual keys. When you create CAs or OCSP services you connect them to an existing crypto token and select which keys on the token should be used for which purposes, all using simple lists that presents you with what is on the token. No need to use separate tools to to manage keys on the token. So what benefits does this give you? Clear and easy to understand management of cryptographic keys. Click and go, no strange HSM commands, no weird hard token properties, easy overview of your HSMs and keys. Full Admin GUI support for key management, including HSM management with easy drop down selections of your type of HSM. No more editing properties! Generate and manage your keys from the GUI, including full audit logging. There are also usability short cuts, such as automatic crypto token creation when creating a new soft token CA, to make it easy to get going. But it is really easy to understand the important aspect of key management in a high security PKI environment. Easy to see and share a single HSM configuration for multiple CAs. No need to configure the same HSM slot multiple times. Easy renewal and creation of link certificates for CAs. Simple generate new keys on the crypto token (during a key ceremony?) and renew the CA using by selecting a key in a drop down list and renewing the CA. Since crypto tokens are not tied to CAs you can configure them for OCSP as well. This gives GUI support for standalone OCSP responders through the use of OCSP Key Bindings. Re-use crypto tokens easily for future services. Another thing with the new crypto tokens is that you can use slot number, slot index or slot label to identify a slot. This is good news for users of some HSMs that either have random slot numbers or that may have different slot numbers on different HSMs in a High Availability (HA) environment. Part 2 of "What's new in EJBCA 6" will be about new improved CMP configuration and CMP aliases. 3 issues have been resolved. The most noteworthy changes can be seen below. This maintenance release contains 1 new feature and 2 bugfixes. It is now possible to store the Base64 certificate data in a separate table. This can improve database scalability for massive scale PKIs with hundreds of millions of certificate. Fixed a possible exception viewing old log in the Admin GUI. Please visit http://www.ejbca.org/ for more information. The PrimeKey SignServer team is happy to announce that SignServer 3.4.1 has been released! This is a maintenance release – in total 19 features, options, bugs and stabilizations have been fixed or added. The most noteworthy changes can be seen below. Support for specifying the signature algorithm in CMS signer. Added support for IPv6 and multiple proxies in ListBasedAddressAuthorizer. Added an option to set the correct TSA name from the subject DN automatically for the time stamp signer. Support for the signerCertificate attribute in the MS Authenticode time stamp signer. Support for generating CSR with ECDSA explicit parameters in the admin GUI and the RenewalWorker. Log worker name in the worker log. Easy import of issuer and serial number from certificate in admin GUI, when adding administrator rules. All workers report themselves as offline when misconfigured. Added health check rate limiter. Added database setup scripts for PostgreSQL. ContentInfo contained a double encoded octet string in the MS Authenticode time stamp signer. Unauthorized health check queries incorrectly logged. Development continues beyond this version and all requests from the community are scheduled for SignServer 3.4.2 or later releases. The PrimeKey EJBCA team is happy to announce that EJBCA 4.0.15 has been released! This is a maintenance release — 5 issues have been resolved. The most noteworthy changes can be seen below. A maintenance release containing 2 new features and 3 improvements. It is now possible to publish certificate serial number in LDAP using a custom LDAP schema. When creating link certificates, a certificate profile can now be used. Two new fields (C and UID) added to end entity email notification, by David Carella. Debug log message when healthcheck fails, makes debugging easier. Development continues beyond this version and all requests from the community are scheduled for EJBCA 4.0.16 or later releases.